Nico Max Richter was born in Amsterdam on December 2nd 1915, the second of three children and the only son of the dentist Izaak Richter and his wife Sara Manheim who both came from Noord-Holland. The assimilated Jewish family lived in the Vondelstraat, where Nico’s father also practiced. The Vondelstraat was and is the site of the Vondel church, where he often went to listen to the music as a small child: there was an Adema organ and both a men’s and a boys’ choir. The young Richters went to the Agatha Deken school, which admitted children from the age of five. They had a professional music teacher, who taught music theory in first and second form. Nico took violin lessons from the ages of seven to fifteen from viola teacher Jacques Muller. While still at elementary school he was sometimes taken to the Concertgebouw, where he was impressed by the music and particularly by the conductor. When Nico started secondary school, shortly before he turned twelve, he was already composing. He finished his first worked out composition, a minuet in Mozart style for violin and piano, at thirteen. At fifteen he was given a different violin teacher, Sam Tromp, second violin in the Concertgebouw orchestra. He graduated school at sixteen, excelling in maths and sciences, but was also very interested in languages and literature, as witness his texts for early compositions: Gorter, Gezelle, Goethe, Heine and Tennyson. Nico’s father demanded that he choose a “real” profession. He was to study medicine and started at the city university of Amsterdam in the fall of 1932. At the same time he enrolled for the preparatory year at the Amsterdam conservatory. Nico was taught the violin there by Sepha Jansen and theory by Ernest Mulder, theory and composition teacher at the conservatory. The first of Richter’s works to survive, was the violin concerto from 1933. His serenade sinfonietta I for chamber orchestra dates from 1934. In 1935 his concertino for cello and six instruments won the Brussels Henri le Boeuf prize, bringing him into contact with the conductor Hermann Scherchen, who was to contribute greatly to his musical development. In the same year he composed the trio for flute, viola and guitar, dedicated to Bertus van Lier who was also studying with Scherchen. That December, he turned twenty. In January 1936 he composed String Quartet I , rediscovered in 2000, and a month later serenade sinfonietta I and the concertino were performed in the small auditorium of the Concertgebouw. The Maneto festival, Manifestation of Netherlandish Music, took place in June 1937 with several composers conducting their own works, including Nico’s trio for flute, viola and guitar. At the university, Nico became a member of the student society Unitas. He conducted its orchestra, the Amsterdam Student Musical Society, known less formally as MUSA. The orchestra had led a torpid life since its foundation in 1912, but it was reborn with the establishment of a chamber orchestra in 1936 and the arrival of “an inspiring young conductor from our own ranks” did the rest. During the same period, Nico came across a classmate from primary school, Hetta Scheffer. She had become a violinist and joined the orchestra. At that time Nico also passed his next set of examinations and became extremely active in Unitas. He made friends with a younger student who, like himself, had become a member of the ochestra and an editor of the student paper: Lex Swaap, to whom he was to teach composition and who became famous after the war as Lex van Delden. Early in 1937 Nico had received a commission from Richard Heuckeroth, the conductor of the Netherlands Chamber Opera Company, to compose a chamber opera with Hendrik Lindt, who was also a well-known music critic, writing the libretto. That summer Nico and Hetta announced their engagement and soon afterwards Nico’s first article on music appeared in the student paper. Late in December, Maurice Ravel, whom Nico greatly admired, died. He devoted his next column to the composer, praising his strong personality and professionalism. Although Richter had great esteem for Debussy and Ravel, he was chiefly influenced by the Second Viennese School: Webern and Berg. With the exception of his opera Amorys, his compositions were for small ensembles, very short and concise. Jewish students were left alone for the time being, but as early as September 1940 Jews were forbidden to take part in public meetings. Nico and Hetta (who wasn’t Jewish) decided to marry at once. They moved in with Hetta’s mother in the Eerste Helmersstraat and in October Nico passed his exams. He then chose tropical medicine to be his special subject. The anti-Jewish measures at the university increased, there were widespread protests and petitions to resist. From what became known after the war about the resistance group of which Nico was a member, it was connected to the faculty of medicine. Nico never said a word about it. He continued to devote himself to the MUSA orchestra. Nico had never felt particularly Jewish, but during that period he ochestrated Ernest Bloch’s religious work Baal Shem. In October 1941 the Germans announced that Jewish students must leave the student societies on November 1st. Although Nico was to graduate within a month, he was still a board member and director of the orchestra. It wasn’t until after the war that an account was published of the thirtieth anniversary celebrations in February 1941. The successful performance “was directed by Nico Richter, without whose participation MUSA has become simply unthinkable.” Nico was dismissed from his positions in the society on October 22nd at the command of the Germans and graduated not quite a month later. There was a small celebration, primarily for him but also because it was his father’s birthday and maybe even because that day marked the beginning of the British offensive in North Africa. Nico had to find a job. As a Jew, even one in a “mixed marriage”, his freedom was severely limited; there was no money to set up a practice and anyway he would only be allowed to have Jewish patients. During that difficult period he composed Two Pieces for violin and piano, dedicated to the violin maker Max Möller Sr. and his former classmate Max Jr.
Nico had presumably met the chemist Willem Mulder in the university laboratories. Mulder, a contemporary of his father’s who lived on the Noorder Amstellaan with his family, ran a school for laboratory analists based at his home and Nico was to start teaching there in the course year 1942-43. This was officially forbidden, but Willem Mulder was strongly anti-German and ignored the regulations. On April 16th 1942, Mulder, his wife and children were arrested, charged with membership of a resistance group. Two days after Mulder’s arrest, Nico was picked up at the crack of dawn and taken to the gaol on the Amstelveenseweg via the Euterpestraat, the headquarters of the Sicherheitsdienst. He had been known to be in danger. There were already plans to find him a place to hide, but it was too late. At the end of May he was moved to the Oranjehotel prison in Scheveningen and from there to the Polizeiliches Durchganglager Amersfoort. As a Jew, Nico wore a yellow triangle to facilitate identification. In Amersfoort he was made to haul turf. Jews were even worse off than others in every way. They were not allowed correspondence and assigned to the most gruelling labour brigades. By December Nico’s back was extremely painful and he had become very weak. 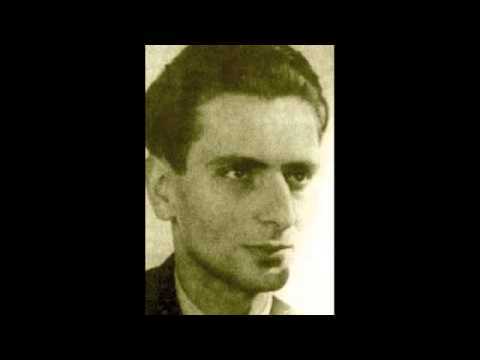 In January he was sent on to the new concentration camp, Vucht, built with money stolen from the Dutch Jews. During the early months of 1943, some three thousand prisoners were taken from Amersfoort to Vught. Nico was sent to the punishment barracks for political prisoners. Only a week later he was taken to the infirmary barracks with intestinal and stomach pains. A German guard/nurse called Heinz Wons worked in the infirmary. He was an enthusiastic amateur musician. Pieter Dolk, who played the trumpet in de Residentie orchestra arrived at the same time as Nico did and Piet van den Hurk, solo flautist of the Utrecht municipal orchestra and conductor of the NCRV (radio) orchestra arrived soon afterwards. The Amsterdam flautist Everard van Royen was also imprisoned in Vught. Wons established a camp orchestra, a professional orchestra with between twenty and twenty-five members, in which Nico played until July 1943 on a violin sent by Hetta. At Vught he also worked on his final composition, the Serenade for flute, violin and viola, published in 1945. Some contact with the outside world was still possible. Nico was occasionally allowed packages and letters from home, but Karla was in hiding and his parents had been picked up and sent to Westerbork during the final razzia. Nico was discharged from the infirmary and sent on to Auschwitz with a large transport of Jewish political prisoners the same day. When he heard what was to happen, Nico expressed his feelings as clearly as he could: he smashed his violin. That same July Willem Mulder and sixteen others were shot by the nazis on the Leusderheide. The transport travelled via Westerbork, where the prisoners were registered and probably not even allowed to leave the train. Sadly, his parents found out about his deportation. In Auschwitz, the regulations forbad his being sent to the gas chamber, as he was a political prisoner. In spite of his fragile health he was sent to the camp hospital to work as a specialist in tropical diseases. Nazi doctors were experimenting there with typhoid fever and Nico was assigned to help take care of their victims. In the meantime his parents had been taken to Bergen-Belsen. They were not to survive the war. When the Russians were approaching Auschwitz in the autumn of 1944, the prisoners were moved to Dachau. Nico was sent to Kaufering to help build three underground bunkers intended for the construction of Messerschmitts. Kaufering, situated in the forest east of Munich, consisted of eleven camps; the most inhumane camps in Germany. Prisoners ate grass and there was some cannibalism. The impossibly heavy labour, hauling rocks, completely exhausted Nico during the final six months of the war. Nevertheless he was working on two movements of the unfinished Serenade, probably in his mind as there was no paper. The music wasn’t written down to his dictation until after his return home. Nico Richter was liberated by the American Seventh Army and repatriated, more dead than alive. Hetta fetched him from Eindhoven and took him home by ambulance, where she and his sister Karla nursed him. He managed to complete the movements Allegretto giocoso (!) and Presto of his Serenade. He died in the night of the 15th-16th of August and was buried at the Nieuwe Oosterbegraafplaats in Amsterdam. Nico Richter was twenty-nine years old. Shortly after the war, Hetta initiated a series of house concerts in her sitting room under the name De Suite. There audiences were made familiar with the music of Nico and other Dutch composers of the period. De Suite was to become famous as a launching pad for contemporary music. In contrast to most other Dutch composers of the period, whose orientation was distinctly French, Nico Richter’s music was more like that of the the Second Vienna School. His style is akin to the Austrian composer Alban Berg’s: very expressionistic and late romantic, but his works were becoming more modern. Although not atonal, they did explore the limits of tonality. The conciseness and trenchancy of his music is sometimes similar to Anton Webern’s. Richter made very free with tonality in his Serenade (1945) for flute, violin and viola. He often employed symmetry, found in compound binary form.